The Red Sox salvaged the tail end of a bad weekend with a 14th-inning victory over the Yankees Sunday night. Jacoby Ellsbury hit the game-winning home run, and the Sox, who dropped the previous two to their rivals, now lead Tampa by a single game in the wild-card race. Yankee manager Joe Girardi was ejected for arguing a close call at first base in extra innings, proving that both sides had a stake in the win. When questioned by the media, Girardi laughed nervously about the incident. Then he laughed a bit more boldly. Before long, he was laughing maniacally, and soon he was spinning around on the floor laughing in a really disturbing falsetto as reporters slowly backed out of the room. The Rays kept the pressure on, winning 5-2 over Toronto on the strength of eight solid innings from Wade Davis. They now finish their season with three home games against the New York Yankees, and were surprised to receive a blank Yankee lineup card in the mail with the message “totally up to you, love Joe G.” scribbled across the top. The New York Giants upset the Philadelphia Eagles on the road, winning 29-16. Eagles QB Michael Vick broke his hand, and was upset after the game. “Looking at the replays, I’m on the ground every time, and I’d be lying if I said I wasn’t frustrated,” Vick said after the game. “The refs have got to do their jobs … I don’t know why I don’t get the 15-yard flags like everybody else does.” Officials disagreed with Vick’s contention. “He’s just being paranoid,” said Brad Anderson, head referee and creator of the comic strip Marmaduke. The second-ranked LSU Tigers took West Virginia by storm, winning 47-21 against the Mountaineers. Following the loss, the evening took on a decidedly somber tone for WVU fans, who barely had the energy to gather in large, frightening groups and burn couches. 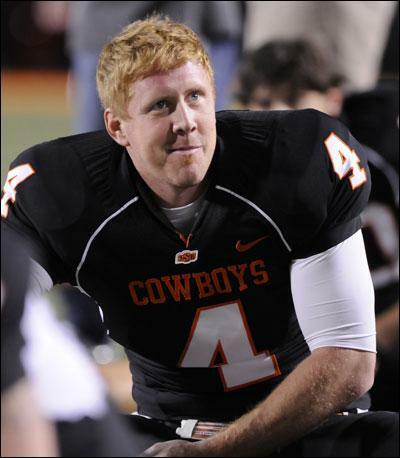 Brandon Weeden’s school-record 438 passing yards led the Oklahoma State Cowboys over Texas A&M 30-29. Weeden, a former minor league baseball player who’s now 27 years old, told reporters that the dramatic win somewhat dims the pain of being Ron Howard’s illegitimate child. Clemson moved to 4-0 with a 35-30 win against 11th-ranked Florida State at home. Tigers receiver Sammy Watkins had 141 yards receiving and two touchdowns, and Tajh Boyd threw for 344 yards. It was the second straight loss for the Seminoles, who are now less popular in Tallahassee than several of the town’s more colorful telemarketers. The Bills moved to 3-0 with a stunning 34-31 home win against the Patriots. Harvard alum Ryan Fitzpatrick, a Harvard graduate, threw for 369 yards and two touchdowns, and graduated from Harvard in 2005 from Harvard Harvard. “I’m from Harvard,” he told reporters, winking like a total Harvard. Texas A&M has officially been accepted into the SEC. The move will take effect next July, and A&M will be in its new conference for the 2012-13 academic year. The deal has been in the making for quite some time, but was held up by the SEC’s lingering suspicion that some of Texas A&M’s football players actually go to class.